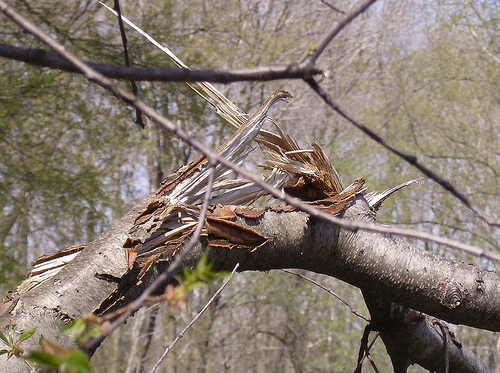 Storm damage to trees can be a very serious issue. What’s more, if the affected trees are on your property, you are personally liable if any further property damage or injuries occur. That’s why after a particularly heavy storm, it behooves the responsible homeowner to take the time to fully inspect the trees on his or her property. A tree doesn’t have to be entirely toppled over in order for action to be taken—even seemingly “minor” problems need to be taken seriously. If you notice any of these issues, it’s time to contact a certified arborist immediately. A storm damaged tree can break and fall suddenly at any time. A certified tree professional can determine whether the tree needs to be removed or not.In many cases, the storm damaged tree can be saved. 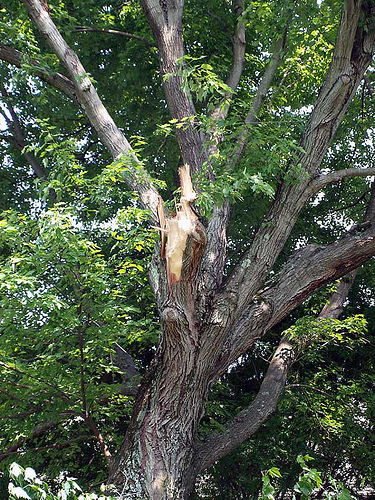 Here are some of the most common tree injuries and their respective remedies. Any protruding strips of tree bark at the point of a break should be removed before smoothing down the wood underneath with a saw and/or sandpaper. It may be possible for a vigilant homeowner to prune away smaller damaged branches that are nearer the base of the tree, but larger limbs, as well as any damage that is higher up, need to be taken care of by an experienced professional. Deeper, gash like splits in an otherwise intact branch can be stripped free of the loose bark and sanded/smoothed. This helps to kick start the natural healing process. You may be able to handle these cuts and gashes on your own, but more severe damage requires professional help. Under no circumstances should a damaged, uneven tree top be cropped even as this can leave it vulnerable to infestation. If more than 50 percent of the crown/canopy is damaged the tree will likely have to be removed. Trees like people and all living things get injured. At times the healing process occurs all on its own or may be helped along by minor interventions. Other times, however, serious work and specialized expertise are required. You can think of your certified arborist then as a tree surgeon. Do you suspect that your tree needs some serious help? Contact Happy Tree Service today.